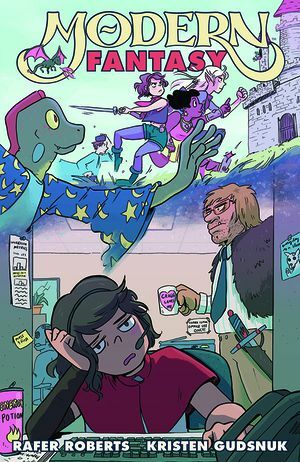 Modern Fantasy is a fun book that melds classic fantasy tropes with a contemporary, almost sitcom, sensibility. One one level it's the tale of a motley band (including a ranger, dwarf, elf, cleric, wizard, ogre, and troll) who quest to prevent a cult of religious zealots from summoning a fire demon that will destroy the world. On another level it's a character study of a bunch of 20-something friends as they go through their daily routines, which includes looks into their love lives, their drab work days, and the mundane frustrations of apartment living. The main character of all this is Sage of the Riverlands, a level 12 ranger who works in a cubicle farm and is frequently bothered/bailed out by her large, oafish co-worker Back-Darr (who I think is supposed to be an ogre). At home she has to deal with her roommates and their significant others, particularly Lizard Wizard whose latest loser boyfriend is a kleptomaniac troll. Early on in the book, this troll steals an amulet from the wrong party and it brings all kinds of drama and misfortune into our heroes' lives. Aside from the brisk plot, I enjoyed the characterizations in this book. I think that the diverse personalities bounce off each other well, and the dialogue is often clever. In addition, there is also a good amount of meta-humor about the whole set-up, and the book proceeds in jaunty fashion, with tongue firmly in cheek. I was taken by the heart and humor here, but the fact that chapter three is mostly dedicated to a training montage was the icing on the cake. Modern Fantasy was a great entertainment that I could easily see spun out into a regular comics series. This book was originally published as a four-issue comic book series, and it was written by Rafer Roberts and drawn by Kristen Gudsnuk. Roberts has written a number of comics over the past two decades, but he is most known for his current series Grumble and a funny online collaboration with Justin Jordan called Thanos and Darkseid: Carpool Buddies of Doom. I first became aware of Gudsnuk's work with her webcomic/collection Henchgirl, and she has a relatively new book out for YA readers called Making Friends. 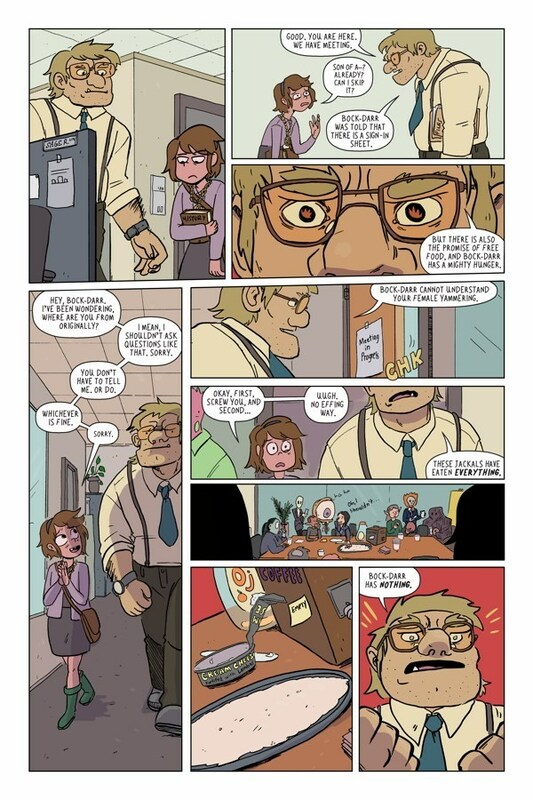 I love her art style, which features lots of background gags, and her comic pacing, details, and character designs match up well with Roberts' story beats. Both creators weigh in about their work on Modern Fantasy in this interview. The reviews I have read about this book and series have been pretty positive. Jeremy Schmidt wrote that it "matches every laugh with a great piece of adventure that will leave you wanting more." Joe Grunenwald called it "super-fun and funny. It’s fantasy for people who don’t like fantasy." Modern Fantasy was published by Dark Horse, and they offer a preview and more here.